Air Leak Found - Universe Galaxies And Stars Section. International Space Station (ISS) engineers are closing in on determining what caused a problem with Astronaut Mike Fincke's Russian spacesuit. The malfunction stopped the Expedition 9 crew's spacewalk just as it was getting started. The primary oxygen bottle on Fincke's Orlan suit began losing pressure faster than expected. Fincke was not in danger, but the crew was directed to return to the airlock, close the hatch and end the spacewalk after about 14 minutes. 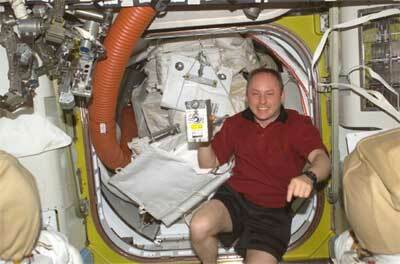 The earliest the spacewalk could be rescheduled is Tuesday, June 29 based on Russian ground communications coverage. During evaluations today, Russian specialists had the crew focus on an injector switch that increases the flow of oxygen into the spacesuit. The crew was asked to manipulate the switch on-and-off several times. Also discussed was the status of an indicator light on the suit for the injector system. The Russian flight control team assured Expedition 9 Commander Gennady Padalka and Fincke, they believe the crew executed the spacewalk procedures well and didn't do anything that would have caused the decrease in pressure. The crew was also told to expect to use the same suits when the spacewalk is rescheduled. Investigations into the cause of the decrease in oxygen tank pressure will continue throughout the weekend. The ISS Mission Management Team will discuss the progress of analysis and plans Tuesday morning. The goal of the spacewalk is to replace a faulty circuit breaker on the exterior of the ISS to restore power to a gyroscope that helps control the Station's orientation in orbit. Yesterday, Fincke and Padalka opened the Pirs docking compartment hatch at 5:56 p.m. EDT. Immediately after Fincke floated out of the airlock, flight controllers in Moscow saw readings that indicated Fincke's suit was losing oxygen pressure. The spacewalkers returned to the airlock and closed the hatch. After conducting preliminary troubleshooting activities, Padalka and Fincke were asked to remove the Orlan spacesuits and assist with troubleshooting of Fincke's suit. The duration of the spacewalk was 14 minutes, 22 seconds. Fincke told Mission Control in Houston, he was pleased flight controllers in Moscow had discovered the oxygen tank problem so quickly and thanked both control teams for their efforts. The ISS has four Control Moment Gyroscopes (CMGs) that are designed to control which way the Station is pointed as it orbits the Earth. CMG 1 failed about two years ago and will be replaced during the next Space Shuttle mission. CMG 2 was taken off line April 21 when a circuit breaker failed. Power to CMG 2 should be restored after the spacewalk. Meanwhile, the two other CMGs are adequately controlling the Station's orientation.